The secret of so much achievement is due to desire and faith. First of all it is necessary to decide on what it is that you want. That might sound obvious, but the majority of the population just go with the flow, living day to day with no real thought of planning, especially planning in the long term future. Having decided what it is that you truly what, it is necessary to build a clear and detailed picture of it in your mind’s eye; seeing it in every detail as you want it to be when achieved. This image in your mind’s eye must then become the object of your desire. The secret of so many people’s successes all through history has been down to being able to keep and maintain this detailed image in their thoughts, revisiting the scene in their minds eye countless times each day and when visiting the scene never ever doubting in it as being obtainable. Total unquestioning faith is required; never give any ground to being negative, no matter what life might try to throw at you to distract you from your chosen aim. Faith is maintained and developed further by positive inner self talk. There is enough negativity around for you to try to keep at bay, without you joining in as well with a load of negative inner self talk. Again the trick is repetition, to repeatedly each and every day, all day long keep your inner self talk positive. That will help to build your faith to an unshakable level. 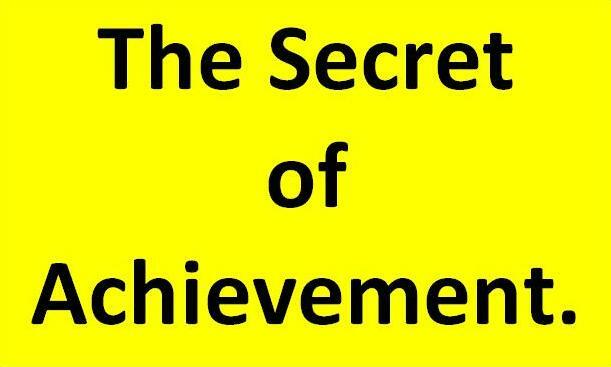 Another secret of so much achievement is that when you visit the scene in your mind’s eye, allow yourself to feel the emotions that you would want to associate with that completed goal, emotions like – pride, happiness, satisfaction, joy. Try to really feel those emotions and combine it with the faith and totally knowing that you are going to achieve just what you set out to achieve. 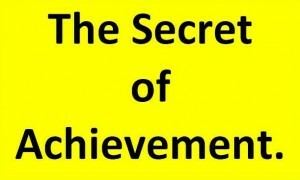 That is the secret of so many people’s achievement.